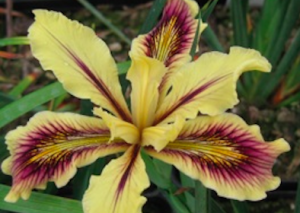 Our good friend Geoff Beasley gave us this very easy to grow, pretty and floriferous selection of Pacific Coast Iris. The broad flowers are a combination of amber, maroon and even black hatch marks. To 14″ tall and produced from grassy spreading evergreen clumps. Full sun to part shade in virtually any soil with a modicum of drainage. Long lived perennial that is best left undisturbed once established. Blooms appear from late April through May. Highly deer resistant. Water for the first year to establish then none in subsequent years.